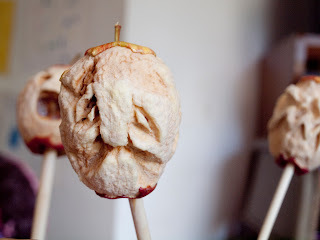 We read about these great little shrunken heads that you can make from apples on the Martha Stewart website: Find it here! 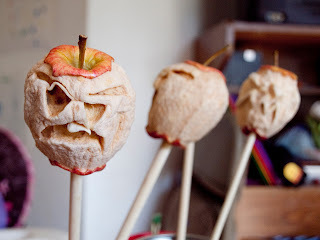 They were so much fun to make! Lily really enjoyed drawing the faces on the apples with pencil- my camera batteries were dead or I would have recorded the fun we had! 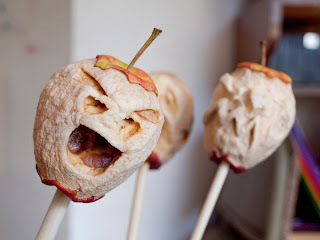 A note if you want to try it, however- make sure that you cover and soak the apple well in the juice. These pictures were taken about a week after we carved them and you can see that they're molding a bit in places where we didn't let it soak enough. They have a great texture and are a wonderful addition to our dining room table! 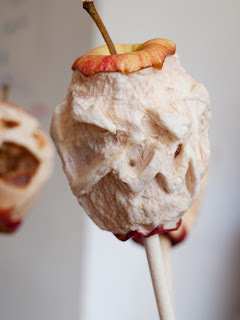 I think the mold makes them extra creepy. Awesome expressions!